Article taken from Good Old Boat magazine: Volume 4, Number 5, September/October 2001. Before the refit: Dabbler as a Marshall Cat Sanderling. 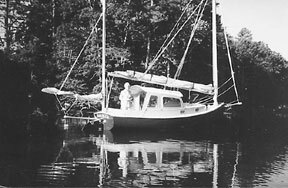 At an age when many sailors retire, sell the house, move aboard, and go cruising, my wife, Dee, and I built a house, sold the boat, moved ashore for the first time in 25 years, and started a business. One of a kind: Dabbler following the "transmogrification"
Very shallow draft (2 feet or less) to give us access to little-used marshy headwaters and other unspoiled Chesapeake niches, let us moor in our local creek, and use the primitive launch ramp there. Courageous sail area for the bay's light summer air but on a divided rig for easy reduction in squalls and breezy weather. Accommodations for short cruises, with emphasis on staying out of the sun and bodily comfort generally, including good ventilation for summer and a wood stove for winter. Inboard power (for all those rivers). Unfortunately, we knew of no such boat. But we had recollections of encounters with a couple of little catboats - Marshall 18 catboats, called Sanderlings - that impressed us with their abilities and possibilities. We saw one in the Gulf Stream, in reefing weather, making no more fuss than our deep-water ketch. We knew one in the Bahamas that could explore wherever we could take our sailing dinghy. In magazines, we found photos of Sanderlings and defaced them with sketches and doodles. Encouraged by the ease with which a pencil transformed the little daysailer/overnighter into our idea of a comfortable, handy pocket cruiser, we decided we could work the same transmogrification on a real Sanderling, substituting a Sawsall, epoxy, and plywood for the pencil. "Transmogrified Marshall 18," also known as Dabbler. All we needed was a lonely, battered, decrepit (cheap!) edition of the design to operate on. Since Sanderlings have been in continuous production since the early 1960s, this would surely be possible. Right off the bat, we found her. The voice on the other end of the phone in Florida said "Hull and deck sound . . . otherwise not too good." No trailer. No equipment. No motor. Suspicious sponginess in plywood components like cockpit and bulkheads. Old sail. Built in l966. Cheap. Just our meat. A terrifying round trip on I-95 landed this econo-prize in our driveway. Dee (a woman used to Brixham trawlers, Gloucester schooners, and deep-water yachts) stifled her reaction when she discovered we couldn't even sit upright below! Instead, she went to her studio and began some serious sketching and doodling. I (a sailmaker) rigged the boat where she lay on her trailer, and backed off a few yards to imagine how she would look as a yawl. While mulling over several schemes, we took a mattock and removed almost 200 pounds of bad plywood cockpit seats, sole, and waterlogged foam, right down to a naked hull from the companionway aft. This made it easy to plan for an engine installation, tankage, storage, and comfort. The finished job included a lucky bargain - a 10-horse Kermath that had lain for many years, mothballed, in a local boatbuilding shop. We had no interest in sharing an 18-footer with a diesel. This smooth, quiet antique went in without problems. A cutout in the solid glass "deadwood" ahead of the rudder (Sawsall job) accommodated the stern bearing and prop. We measured for the beds by suspending the little engine in place from the boom. With an 11-gallon aluminum tank, blower, and electrics, we were beginning to look forward to poking up rivers and creeks in style. We replaced the original benches with a U-shaped cockpit surrounding the engine box and introduced a bridge deck with big lockers and more lockers aft. We dropped the sole several inches for more leg room. 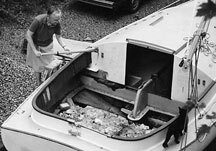 Under the seats, outboard, was space for bins and sailbags held in place with removable fiddles. Our more comfortable and useful cockpit (worked up out of CDX and epoxy) weighed about what we chopped out. A few pigs of lead ballast were removed to compensate for the motor. We launched the Dabbler (named after the mallards that dabble in our local creek) for some cruising with a local club. The inboard and new cockpit were a great success, but otherwise the experience confirmed our opinion that we wanted to replace the single big sail with a divided rig. And after a few nights cramped below, we could hardly wait to haul her out, grab the Sawsall, and take the lid off the sardine can. Demolition: out come 200 pounds of rotten and waterlogged cockpit. Dabbler's removable, waterproof, polycarbonate windows. Some of our bold, even arrogant, sketches evolved from a doodle for a dodger. Why not make the dodger rigid and cut away the aft part of the cabintop so the hardtop effectively encloses a greatly enlarged cabin? Why not provide standing headroom for the mate (5' 5"), with a little "galley" on the new bridge deck? Why not have full sitting headroom on comfortable chairs aft of the bunks? Why not fit removable windows and screens? Why not extend the roof far enough aft to provide shade and spray protection for the helmsman? A mockup in cheap 1/8-inch luan ply (which later served as templates and as a building mold for the final construction), proved there was no reason why not. A few minutes of surgery liberated about 90 pounds of cabintop and bulkhead. Immediately, we could test with our bodies the thesis expressed on paper. Proof we could sit upright, surveying some lovely, lonely anchorage from the comfort within, spurred the work. 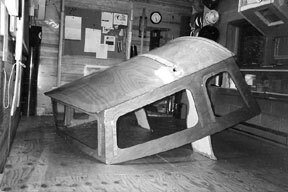 The house was designed to join the existing structure across the cabintop a few inches forward of the original hatch opening with an epoxy filet; outside the cabinsides and cockpit coamings, with a 2-inch overlap, were epoxied and throughbolted. We turned our backs on the local lumberyard for the deckhouse project and ordered expensive 3-mm okoume marine ply to be laminated in place over the mockup to lock in the heavily cambered top and curved front and create the eyebrows that trap the removable polycarbonate windows. All the construction was done in a corner of my small sail loft between sailmaking jobs. We barely got it out the 8-ft wide doors! It dropped in place as neat as a cab on a pickup. Final weight was less than what had been removed with the Sawsall. The new effective interior includes the bunks (as original), our "easy chairs" (cheap but comfortable plastic swivel-bottom fishermen's seats) port and starboard, the bridge deck, comprising "galley" with gimbaled kero stove to starboard, solid-fuel cast iron Pet to port, and the forward half of the cockpit. At anchor, if desired, the fitted Sunbrella aft closure snaps in place, enlarging the "interior" to include practically the whole boat. In cold or wet (and on the mooring) the large screened opening in this closure is covered with a vinyl window. Otherwise, the screen liberates the breeze that comes in the forehatch and opened doghouse windows. The new cabintop takes shape in the sail loft. Dabbler's deckhouse is in place, the engine box removed, the bridge deck lockers installed. There is no novelty in the cat yawl rig. The aim is to easily have more sail area when you want it and less when you want it in order to balance the boat under almost any condition. We have about 25 percent more sail area in the three working sails than the original cat rig. From the comfort of the cockpit, we can set a mizzen stays'l, and be flying 375 square feet. In races, we have been able to astonish the locals with five sails. The new rig satisfied all our expectations. Sails can be adjusted to tame weather helm (a notorious fault of catboats) or dropped (instead of reefing, notoriously difficult in catboats) to suit the breeze. In gradually increasing wind, the mizzen might come down to lighten the helm. In a squall, we drop the main and stay in comfortable control under jib and jigger. Under this rig, she will go to windward in 15 or 20 knots with just a little weather helm, broad reach with almost neutral helm, and selfsteer indefinitely downwind with the mizzen broad off and the jib flattened in. An unexpected but welcome bonus is that when anchored by her long snout, the windage in the house and mizzenmast makes her lie to the wind like an arrow, whereas catboats are known to wander restlessly at anchor. Engineering was fairly straightforward. The main boom was raised (to clear the housetop) and shortened (to clear the mizzen). Sawsall holes accommodate the mizzen mast, bowsprit, and bumpkin. The latter can be removed for trailering, and the 'sprit just clears the towing vehicle. But we would make it retractable, if we had it to do over. The new spars are Schedule 10 aluminum pipe, fitted with tapered douglas fir inserts to complete the finished lengths and help fool the eye, while providing meat for sheaves, eyebolts, anchor rollers, and so on. The mizzen steps easily by hand. It can be temporarily relocated to a special hole in the foredeck (which doubles as the anchor rode deck pipe) where it serves as a gin-pole for stepping the main. Finally, the sailmaker gets into the act. Since my business is making traditional sails, the suit for the new rig presented no unusual difficulties. We chose Egyptian Dacron for a good color scheme, and because it has a nice, moderately soft hand. 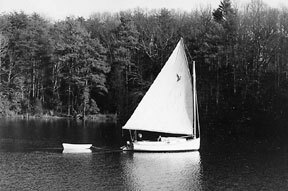 The full battens may look modern, but Nat Herreshoff used them on a little cat yawl of his own way back when. They help flatten and control the very-low-aspect main and make it stack neatly in the lazy-jacks. This is also ideal for the mizzen, which must be kept very flat when sailing and when left standing at anchor. 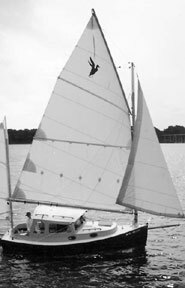 A half-wishbone sprit boom controls mizzen shape on all points of sail. The jib furls on its own braided Dacron luff rope, which acts as a forestay. Dabbler out cruising with first mate Dee Carstarphen. The transmogrification accomplished standing headroom with a great view through large windows. It was exciting work making dramatic changes, spiced with moments of delicious anticipation and delicious satisfaction when we got what we hoped for. The final product is a great, very small cruising machine, in which we have prowled both shores and many tributaries of the bay, sailing in comfort and safety, holding our own with bigger boats in fair weather and foul (we take shortcuts), yet coming to anchor in the marshes, while the bigger boats tough it out with the crowds. In between all the fun, we had the grubwork of any restoration: things like removing 25 years of bottom paint; repairing centerboards and rudders, coamings and rubrails; cleaning, sanding, and refinishing everything; rebedding everything. We might have been spared much of this work if we started with a younger, well-maintained hull. But who would take a Sawsall to a Bristol-condition late-model boat, even if they could afford it? Much better to do surgery in good conscience when the patient is already teetering on the brink. Would we do it again? Well, ah . . . actually, we are doing it again. It's the fault of a friend who had a Marshall 22 catboat (twice the displacement of the l8-footer, but only 6 inches more draft). He had an epiphany of some kind and all at once wanted to move to the mountains. His house sold out from under him before he had a chance to advertise the boat. Would we . . . as a favor . . . at a distress price . . . ? "She's 30 years old," he said, "but basically sound, except for a few little things . . . " She's got that solid old pre-blister hull, but rot in the cockpit and splits in the rail. Corroded through-hulls and rusted-up steering system. Busted hatches. Tired sail. And, believe it or not, you can't sit upright below! Just our meat. No reason why not to take a Sawsall to the poor old dear and transmogrify her a little. Dee has already made a sketch of what we think she'll look like. After a false start in life as a journalist, Stuart left Chicago aboard a 30-foot ketch, and stayed afloat for 25 years. His wife, Dee Carstarphen (a founding member of the Seven Seas Cruising Association) had an even longer career on the water. They now live near a Chesapeake Bay creek just deep enough for catboats. In his retirement, Stuart is a full-time sailmaker, specializing in traditional small craft sails. Dee is the author of four illustrated nautical books, including Narrow Waters, reviewed in the September 1999 Good Old Boat. Dabbler's favorite rendezvous, where Stuart and Dee like to "astonish the locals (with Dabbler's sailing ability)" is the Turkey Shoot Regatta, held each October on Virginia's Rappahannok River. Stuart says, "Dabbler's tiny cabin is adorned with three little brass plaques, each indicating her participation in a Turkey Shoot. We were always the smallest boat in the fleet. Every participant gets these plaques. The T-shirts you have to buy!" Boats in this event must be of wood or of a classic design 25 years old or older. Last year's winning boat was a 1970 Irwin 38, sailed by Wayland Rennie. This year Hal Roth will serve as honorary chairman. And for the first time the event will include restored skipjacks (see January 2001 Good Old Boat for more about skipjacks) in the race. All proceeds go to the Northern Neck Hospice. Want to know more? Yankee Point Sailboat Marina: 804-462-7018 or http://www.yankeepointmarina.com.